We supplies a range of warehouse solutions and takes single source responsibility for the design, manufacture, shipment and erection of warehouse solutions that can be used for applications in varied segments. We offer complete turnkey construction solutions ranging from detailing to on-site erection along with maintenance and after sales services, all under one roof. 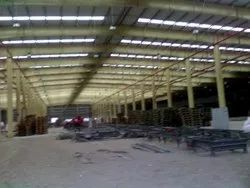 We are expert RCC & PEB warehouse Construction. We have requisite expertise & capcity to handle any scale of Institutional projects on Turnkey basis.